On Friday, she’ll give a free public lecture titled “Browsers, Web Standards, and IE8” in Krauss Hall at 7 p.m. Those looking for more intensive instruction can sign up for “Hot n` Spicy Style with CSS,” running 9:00 a.m. to 4:00 p.m. on Saturday and Sunday in Sakamaki Hall (the Manoa MultiMedia Lab). Registration is $270. Holzschlag co-authored “The Zen of CSS Design” and has written over 30 other books related to web design and development. 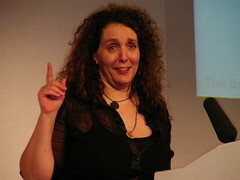 Named one of the 25 Most Influential Women on the Web, she is a steering committee member of the Web Standards Project. Crossposted to Manoa Geeks. Photo by Martin Kliehm.